Scientists suggest three names for the public to vote on after the planet was found in 2007 orbiting the sun beyond Neptune. The objective of the Global Internet Forum to Counter Terrorism is to substantially disrupt terrorists' ability to promote terrorism, disseminate violent extremist propaganda, and exploit or glorify real-world acts of violence using our platforms. The government says a "small number" have travelled back via third countries in the past year. The mother sobbed uncontrollably as she carried her newborn baby to the manager of the muddy and windswept camp in northeastern Syria. Human rights lawyers have today filed the first ever case against Syrian president Bashar al-Assad and his government at The Hague, after making a “breakthrough” in attempts to hold the regime to account. 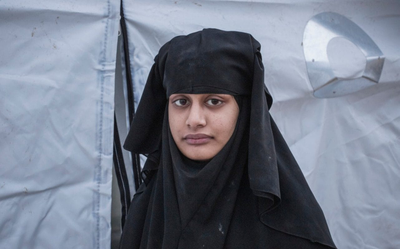 When Frontline member Anthony Loyd found Shamima Begum in al-Hawl refugee camp, northern Syria, he helped unearth a series of unanswered questions for Western societies - and kickstarted a national debate in the United Kingdom.